In this day and age, it’s practically impossible to not be confronted with automated technology left, right, and center. With our growing reliance on technology and digital infrastructure, there are a lot of people interested in using robots to further our interests, increase efficiency, and exert greater control over our world’s resources and networks. There’s an entire world of robots out there, waiting to be explored and understood, and the first step to getting your child exposed to this amazing collection of awesome knowledge is through a class that can teach them the basics. Snapology has seen this need for a broader understanding of robotics, and is offering a whole series of classes available to kids age 3 - 14 where they can explore how to solve complex problems and create awesome robots with platforms like Lego Mindstorms. Read on to see all of the amazing opportunities available to you, and see which one suits your child’s interests best. This camp is for children age 4 to 6. Kinderbots is the kind of experience that I wish I had gone through as a child. 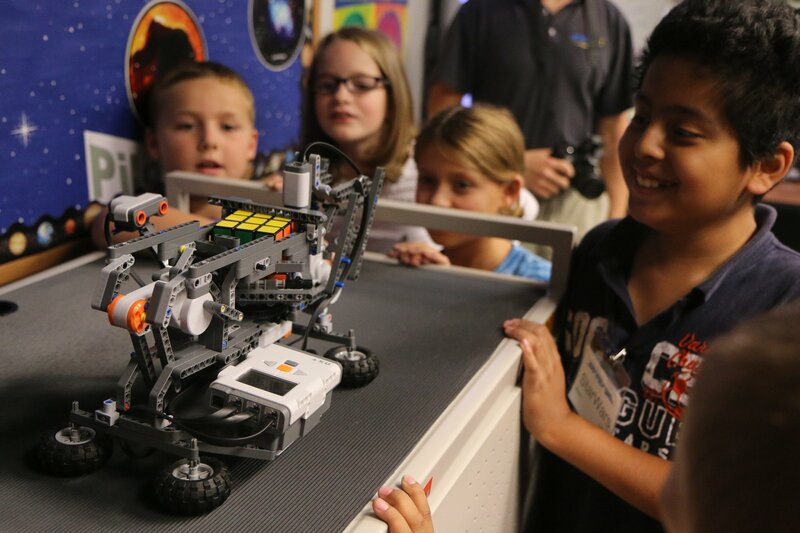 This wonderful camp is all about showing the younger ones all of the amazing possibilities of robotics through fun and engaging projects that show them how enjoyable robotics is at its core. Some of the potential projects include building drills, magic wands, and helicopters, all while learning about robotics fundamentals and engineering principles like sensors, pulleys, computer coding, and problem solving skills. While that might sound like a lot, it’s all communicated through a friendly and entertaining curriculum that will trick the kids into not even knowing that they’re learning, and you’d be surprised at how good kindergarteners can be at building robots. As an introductory course that promises to plant the seed of a love for robotics at a tender age, this course is a great start to your child’s path on forging critical new technologies in an age of digital enlightenment. This camp is for children ages 7 to 14. This class is going to be essential for any child of yours that’s always creating games out of thin air with rules that change from one minute to the next. In order to spark their creativity and to let their need to stimulate themselves through play thrive, this class will have your kid using computer programming and engineering know-how to build robots that allow you and your child to play duck hunt, ring toss, a pinball machine, and more. The great part about this class is that once your child has impressed you with their awesome new coding and building skills, everyone can enjoy the pleasure of playing a game together and bonding over this achievement. Plus, it’s a great way to get out of going to a carnival or the boardwalk: simulate the fun and energy of those classic games with something your kid has made themselves! It’s already known that playing games together is a great way to bond as a family, so imagine playing something your own child has created! These skills are extremely practical, and though they’re framed through play, they’ll reinforce strong problem-solving skills and practical thinking for your child that will be useful for their entire lives. This camp is for ages 7 to 14. As if all of these classes didn’t teach your kid about robotics in the real world, this class decides to take that knowledge a step further. Finding the sublime and the interesting in what at first glance is ordinary and mundane, this class will teach your fascinated kid all about the technology that goes into devices like electronic alarms, earthquake detectors, robotic arms, and more exciting applications. If your kid is interested in taking apart everyday objects to see what’s inside, or even if they just exhibit a general curiosity to how the things around them work (who doesn’t?) then instead of letting that curiosity fade away you could feed it by letting them explore the way things work all around them, showing them the beauty and power of the possibilities of our electronic age. Your kid will also have a chance to build something of their own along the way, which lets them add their own piece to the expansive archive of human technology in a way that will inspire them to keep creating for years. This class offers your child a delightful combination of the biological world and robotics. In this experience, they’ll use engineering principles to design their own versions of animals found in the natural world, like insects, dolphins, and gorillas. While this activity already sounds like a lot of fun on its own, it’s also a real engineering consideration. Biomimetic approaches to science and engineering involve this exact thought process of trying to use applications from the natural world in solving problems we have in the human realm. With this in mind, it’s invaluable to be reinforcing this thought process in your child with the rest of the world so earnestly pursuing this exact way of thinking. Plus, like we said, it’s a whole bucket of fun! Your child is sure to have a blast as they not only learn the fundamentals of robotics, but also absorb a complex and important way of thinking that real world problem-solvers pursue every day. We hope this list of Snapology’s robotics classes inspired you and your child to explore the possibilities of robotics. You can find all of these classes, and more, within the course catalog online. With robots being created for more and more applications every day, this is an invaluable skill that will only help your child succeed in the rest of their life. Even if they don’t pursue a career in robotics the problem-solving skills and computer literacy will be crucial to whatever job they take as adults. No matter which class you end up picking, rest easy knowing that your child is learning an important skill, and having oodles of fun doing it!